A fashion and lifestyle blog of a "twenty something" girl living and working in London. When it comes to self tan, I have probably tried them all - the okay, the bad and the questionable. Being a pale redhead I have struggled for 20 years to get something - anything - resembling a tan. Now I am not talking a golden bronzed tan. No, I am merely talking about a barely there tan that looks like my skin has actually seen the sun in the last 365 days. Nothing wrong with being pale, I have actually come to accept it and even embrace it. But a bit of colour is always welcome. A couple of years ago I though I had solved my 'pale problem' with the St Tropez tanning mousse but looking back it still looked 'fake baked' and my skin was still too pale for it to actually properly absorb the mousse. While wondering around BoxPark in Shoreditch last week I came across a little pop up store which was selling cosmetic brands from all over the world. Like any respectable British 'beauty shop' it had a good choice and variety of self tanning solutions. One of which was the James Read Bronzing Mousse. I was curious - and well let's be honest, the shopkeeper was a good sales person - and so I brought a bottle home. The mousse comes out like whipped cream and is already tinted. After a couple of hours both the colour and mousse have settled in and will stay put until you take a shower. The colour is a light but bronzed tan which develops nicely over time. It will get darker with every application without ever going orange. It is more or less odourless, and doesn't overly smell of self tanner. As with every self tanner; exfoliate before, and prepare your skin with a good moisturiser or some dry oil (Argan oil for example - see last pic). 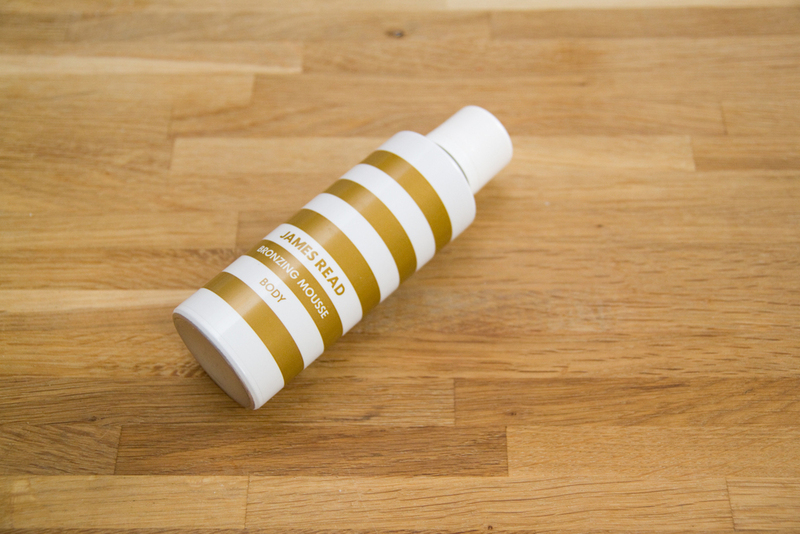 Basically I am sold on the product and will be trying out the James Read Studio in Harvey Nichols in the coming weeks. Not quite sure what to expect to be honest but thought it was worth a try. And in all honesty all of this is better than lying in the sun for hours on end burning or lying under UV lights. I can stress enough your should always use UV protection and just stay out of sun beds. It has been a while since I didn't do a beauty products post and since I popped into The Body Shop for a refill of some old products and had a look for some new ones, I thought I would share my finds with you. First up is the Vitamin E illuminating moisture cream from the Body Shop. This is one of my all time favourite moisturising creams. When my skin is having a good day I will use this as it give a nice base to your skin and because it contains light-reflective particles it brightens the skin right up. I haven't tried it yet, but I am looking forward to getting my hands on the Vitamin E cool BB cream from this collection. While in The Body Shop, I picked up a few product from the Tea Tree range; the facial wash and the skin clearing lotion. They have now become part of my morning routine and both are really refreshing products to try out. When I was in Brussels I also picked up a few Catrice products from the multi colour range; the compact powder for lighter skin and the blush. Both products are great for people with fairer skin tones like mine . If you haven't seen it yet you can read about some of my all time favourite products here. I have yet to visit the store in London - but I am sure I will get round to it in the near future. In the meantime I checked out their online store, and it was a pleasure. It was like nothing I had seen before, all the items had a story to share and were showcased within this story - a very clever way of making buyers buy the entire outfit or 'story'. The choice is endless - whether it is the accessories, the bags, the clothes or even the makeup. As it so happens I needed a new brush and foundation. I didn't really need the gorgeous purple dress but I can't wait to wear it. In all honestly, I can't wait to go back and shop some more. I have a fashion or rather a beauty - confession to make. Until two weeks ago, I really didn't believe in paying more than a couple of Euros for nail polish. I don't know why, there was just something so ridiculous with the idea of spending anything between 11€ and 25€ on a small pot of colour. So I brought H&M nail polish, HEMA nail polish and any other cheap stuff I could get my hands on. Don't get me wrong I like these brands but they really shouldn't be doing nail polish. No only was the stuff useless - I can now say that - in that it always came off, but it completely ruined my nails. So when the first Deauty box arrived at my door and inside was a lovely pot of red nail polish, I was very intrigued to try it out. Let me tell you it was blissful. What a tragic discovery I had just made, I could sense this was going to come and bite me in the backside. That it did, of course now it's all about the 'good stuff' and that doesn't come cheap. Clearly, sometimes the price does explain the quality and effectiveness of the products - sadly this is not always entirely true. I was also tempted to try out the product many have been raving about - the Drip Dry by OPI, and it does indeed work wonder, a few drops and your nails are instantly dry. So here are the colours I have been wearing this Autumn and winter. From left to right: Sew psyched, Chinchilly, Angora cardi and Lint candy apple. What are you winter colours and what brands do you use?